Last summer, Eugene and I were lucky enough to spend a few days in New Orleans eating our way through that magnificent city. We came home with a taste for all things Creole, and for a few days, I kept it up, doing my best to recreate some of our new favorite flavors at home. The thing is, that I soon ran out of the patience needed for those slow-cooking high maintenance dishes. On a relaxed weekend? Surely! On a random Tuesday? Um...unlikely. So when I was offered the chance to try out a variety of new organic simmer sauces from Imagine® and work with them to create a few recipes, I admit that I was a bit skeptical, but curious. I tend to be a from-scratch kind of girl, but I do love the occasional short-cut if I know it's a quality ingredient, which to me means it's loaded with good REAL ingredients I can pronounce and recognize, and free from GMOs, preservatives, MSG, and other funky stuff. I've been using Imagine® organic broths for years; it's actually my go-to brand, so on a hunch that these would be just as good, I said yes and crossed my fingers. You guys have no idea how excited I was to find out they're not only good, but actually amazing! Perfectly seasoned flavor with fresh-tasting ingredients, and no weird package-y aftertaste. Imagine® Culinary Simmer Sauce come in four varieties: Louisiana Creole, Latin Veracruz (which I have awesome plans for so stay tuned! ), Portobello Red Wine, and Thai Coconut Curry. Each pouch is enough for a dish that will feed about 4-6 people. The most basic way of using it to sear up your protein (shrimp, chicken, whatever), add the sauce and let it simmer a few minutes, and boom! Serve it up with a side of some kind. 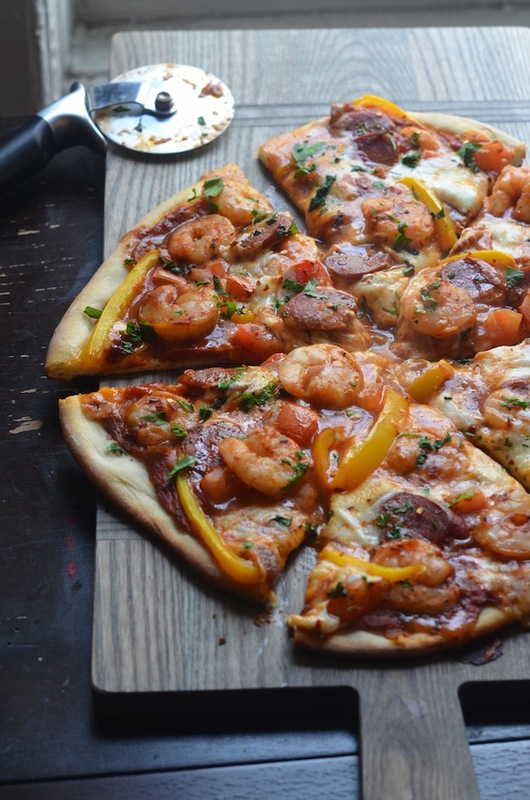 But that's not all you can do, so I decided to use the Louisiana Creole simmer sauce to make the best/quickest/easiest Spicy Creole Shrimp Pizza ever. I started off with some pizza dough. Mine was homemade from my fridge, but you can totally use your favorite store-bought refrigerated or frozen dough. I preheated my oven as high as it would go--seriously, crank that baby up! Then rolled out the dough on a greased baking sheet, and spread with the Louisiana Creole simmer sauce, the same way you would typically use tomato sauce. 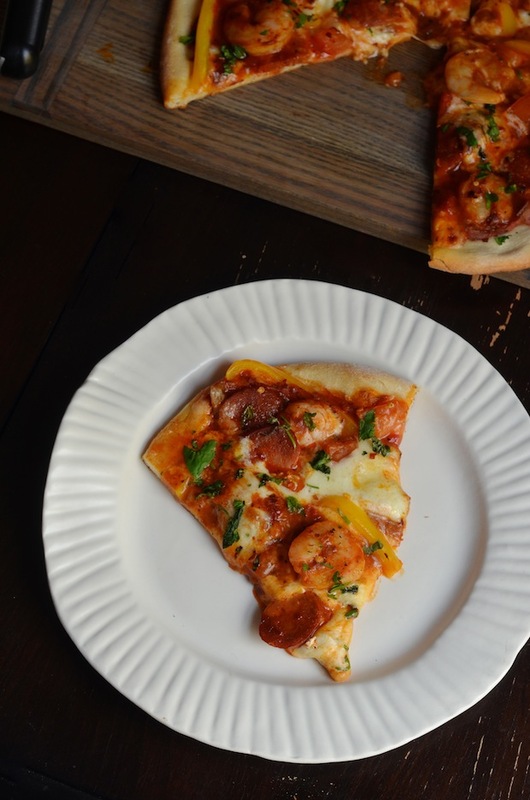 I topped it off with some peeled shrimp, a few slices of spicy, smoky Andouille sausage, and mozzarella cheese. I happened to have a bell pepper that needed to be used up, so I added that in, too, but it's totally not necessary since the sauce already has loads of diced peppers in it. This went into my preheated oven for about 10 to 15 minutes, and voila! 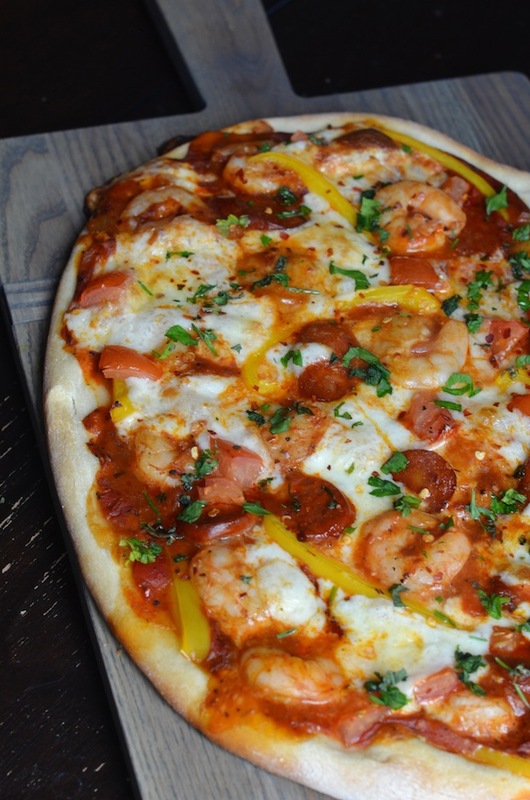 Seriously amazing Spicy Creole Shrimp Pizza. I added some red pepper flakes and a little parsley on top, then sliced it. Eugene and I devoured this in 5 minutes. Eugene didn't even bother to sit down, just kind of standing with a plate hovering over the counter. If you'd like to recreate this recipe at home, I've got a fun treat for you! The folks at Imagine® are hosting an awesome sweeps where they're giving away a "Pan with a Plan" prize pack that includes a beautiful sauté pan, four Imagine® Organic Culinary Simmer Sauces, and a $25 gift card. Preheat oven to 525 degrees F, or as high as your oven will go. 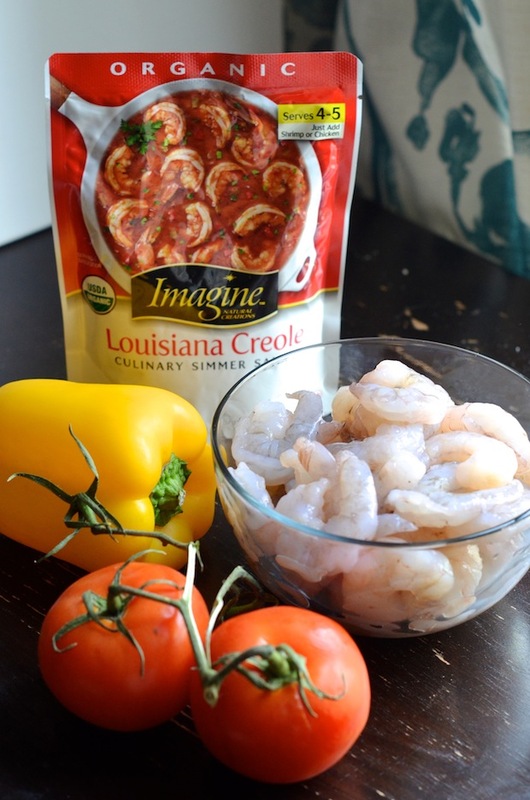 Spread Imagine® Culinary Simmer Sauce on the pizza dough, then top with shrimp, sliced andouille sausage, veggie toppings (if using) and sliced mozzarella. Place on the lowest rack in the oven, and bake 10-15 minutes, or until the crust is golden brown and the toppings are bubbling. Garnish with red pepper flakes and minced parsley, if desired. Let cool 5-10 minutes before cutting and serving.